This report provides an overview of assessments that have been conducted in the Great Lakes Basin to determine the vulnerability of natural ecosystems to the impacts of climate change. 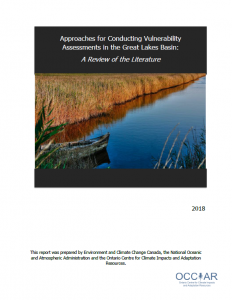 The purpose of the report is to inform the development and implementation of vulnerability assessments by members of the Great Lakes research community, resource managers, practitioners and decision-makers. The report compiles information on the various types and approaches of assessments, including commonalities or differences in approaches, processes, frameworks, methods, tools, models, data and other aspects of conducting a vulnerability assessment. The report was developed by members of the GLWQA Climate Impacts Annex Extended Subcommittee, with significant contributions from the Ontario Centre for Climate Impacts and Adaptation Resources. This entry was posted in Climate Change Impacts (Annex 9), Climate Change Impacts Documents, Documents by . Bookmark the permalink.